French prop Alexis Core has been included in the Scarborough RUFC squad for Saturday's trip to Bridlington in North One East. Last Saturday Scarborough opened their league account with a big win at Bradford and Bingley. The Seasiders raced to an early 24-12 lead and further touchdowns from fly-half Tom Ratcliffe, scrum-half Jordi Wakeham and substitute Joe Marshall saw them lead 29-12 at the break. Second-half tries from Jonty Holloway, skipper Matty Jones and a second from Jimmy Perrett plus 18 points from the boot of Ratcliffe saw Simon Smith’s charges to a resounding 53-33 win. Full-back Tom Harrison twisted a knee and limped off early in the proceedings to be replaced by Joe Marshall and is awaiting an MRI scan. Wingman Matty Young played in the centre for the unavailable Billy Parker who returns this week as Young is on his annual holida. With Matty Jones leaving shortly for New Zealand and winger Jonty Holloway leaving for university in late September and Harry Domett retired the Seasiders are struggling to bolster their squad. However, Scarborough RUFC Ltd although a big organization is a community club and is therefore strictly amateur on the playing side; so unlike professional or semi-pro sports clubs they don’t have the option to just go out and sign replacements when players leave or retire. 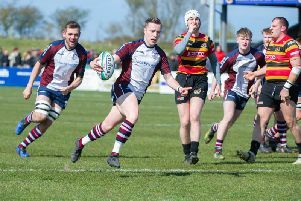 Good stewardship at Silver Royd has seen many of the present squad come through the ranks from the age of seven and hopefully that conveyer belt will continue to function; however once young players get to 18 they are more than likely to leave for university and therefore I suppose the ‘circle of rugby life’ for a community club is complete. Last Saturday Bridlington lost by the narrowest of margins going down 26-27 at Pockington but I’m sure the men from Dukes Park will be up to the challenge of Scarborough in their first local derby played at North One East level.